Tomorrow is the Readathon, tomorrow is the Readathon! If you don't know, Dewey's 24 Hour Readathon is an event held twice each year where readers sign up to...well, read for 24 hours or as many as they can! There is lots of encouragement from fellow readers and cheerleaders, challenges to try, and prizes to win. Sound like fun? You can still sign up here! I still have some of How We Learn to finish, so we will see how much reading I can accomplish. I will be blogging throughout the day, so check back for lots of fun and reading! 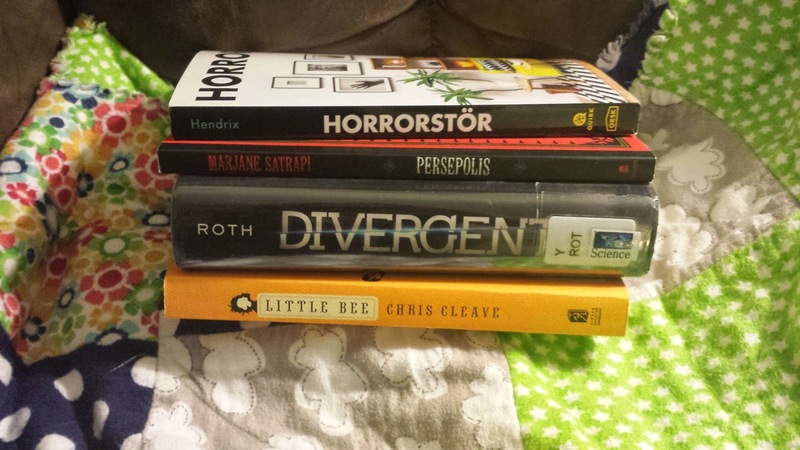 Ok, I have to know: HOW do you readathon with young kids?? I have pretty much resigned myself to the fact that I won't be participating for another 6-8 years at least. Haha! Ok, so here is what I am doing: My hubby is going to be home all day which is lovely (although it hasn't always happened that way). David actually likes to read along for a while and then he is pretty good at playing by himself. BG can be a bit more challenging, but she still takes two naps, so that helps. And of course, a lot of reading will get done after 8 p.m.! Good plan!! It would be hard for me, my three year old wants pretty constant attention. The baby is better at entertaining himself, haha. Maybe next year, if I plan ahead well enough...hmmmm. Excellent choices! I've yet to read Little Bee or Horrorstor but hear they're pretty good. Loved Persepolis! One of the first graphic novels I bought! Happy readathoning! It will be my first graphic novel and I'm really excited! I'll check back in tomorrow during the read-a-thon and see how you are doing. I get to participate this time! I'll be updating on my blog too. I have HorrorStor in my stack too!! I'm so looking forward to tomorrow. I have the plan for quiet house all set up. Happy Reading!! I hope you get round to reading HorrorStor, I've been interested in that one. Good luck with the readathon! These look like SUCH fun choices! Then again, you need a pretty good variety to keep you reading, especially if you're trying for the full 24 hours, straight through. Good luck! That is true! I know that I won't get through everything, but you just don't know what will be the right read until you start.